The Balla Hissar and the city of Caubul, from the upper part of the citadel. bl.uk > Online Gallery Home	> Online exhibitions	> Asia, Pacific and Africa Collections	> The Balla Hissar and the city of Caubul, from the upper part of the citadel. Plate 20 from "Sketches of Afghaunistan" by James Atkinson. 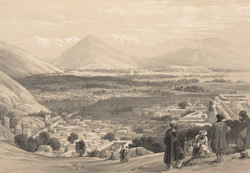 Kabul, an important trading centre, was the capital and largest city of Afghanistan. As the seat of the Emirs of Afghanistan, the Bala-Hissar Fortress overlooking Kabul had immense symbolic power. Perched atop the strategic hill of Shirdarwaza, the thick-walled brick and clay fortress was hundreds of years old. In 1839, with Dost Mohammed gone, Shah Shuja occupied the Bala-Hissar with his 600-strong harem. The British now felt safe enough to vacate the fortress and move into a cantonment they built just outside the city, an action which would later prove unwise. Atkinson wrote, 'The roofs of the houses are flat, and but ill-suited to a climate in which so much snow falls. It was from Balla Hissar, the British troops were recalled to the cantonment, dispirited and illy clad, and suffering most acutely under the deprivation of food, which scanty allowance they could only obtain by bribery and plunder during the night'.